It’s no secret. I have a soft spot for Italy. When I first started in the wine industry more than 20 years ago, it was not a predetermined path that led me to take a special interest in this regionally diverse country. Instead, the wines of Italy found me. There is an allure to, and I am fascinated by, the hundreds of indigenous grape varieties (over 500 that have been genetically identified and an equal number yet to be identified); the regional diversity (Italy was only unified as a country just over 150 years ago); the intricacies (and sometime frustrations) of the wine producing regulations and the perceived confusion in deciphering Italian wine labels. But it’s more than just the wines. I love the food, the culture, the history, the people and that each of the country’s 20 regions are so culturally and gastronomically distinct. I empathize with the Italians’ obsession with digestion. I can relate to their aversion to catching a chill and avoiding getting “wind” (my word) on their necks, backs and chests. I even get a kick when they mock you if you order a “caffè” containing milk (latte or cappuccino) anytime beyond mid-morning — which also relates to their obsession with digestion (milk fat is hard to digest). I once ordered a caffè macchiato after dinner and was mocked relentlessly by my Sardinian hosts. Suffice it to say, I never made that mistake again. Over the past 15 years, I’ve been to Italy on 30-plus occasions and travelled extensively throughout much of the country. My wife and I were married in Italy. I’ve always believed that wine gets its context from the people, place, culture and history of its origins. There may not be a country that better exemplifies this than Italy. So when VinItaly International Academy (VIA) announced that it was accepting applications for a course to certify Italian wine ambassadors, how could I resist? I, along with 54 other selected candidates from 17 countries, gathered in Verona earlier this year for a weeklong program of lectures and tastings led by Dr Ian d’Agata, VinItaly’s Scientific Director and one of, if not THE world’s most knowledgeable and insightful authority on Italian wine. 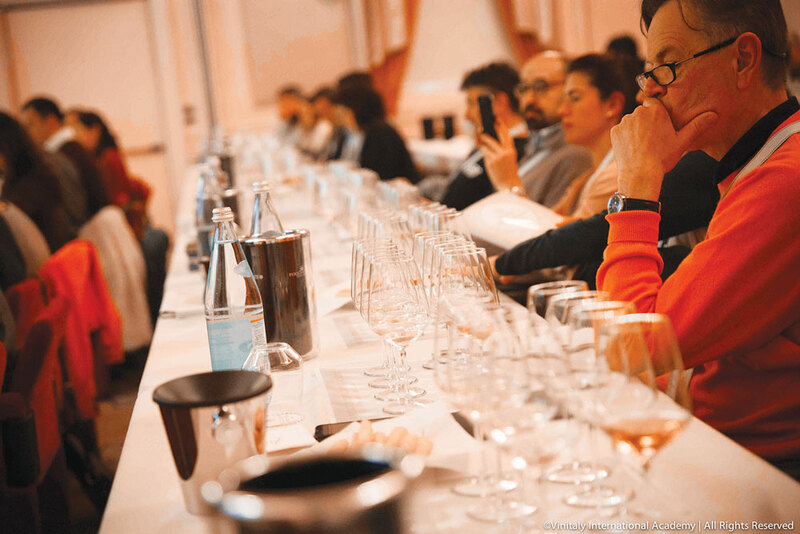 The purpose of the course was clear from the onset: to create a global network of wine professionals to educate and promote the quality and diversity of Italian wines using consistent and accurate information. The level of experience and quality of the candidates was impressive. Top professionals — sommeliers, retailers, distributors, journalists, educators and several Master of Wine candidates — from all corners of the globe, all with the expectation of passing the course and achieving either the Italian Wine Ambassador or Italian Wine Expert designation. Regardless of the individual’s background, it became clear quite early in the week that passing the exam was going to be much more than a formality and you would have had to have significant prior exposure to Italian wines to even have a shot. Dr d’Agata covered aspects of the history and culture of Italy along with more information of the science and genetics of grape varieties (biotypes, genotypes, phenotypes, ampelology vs ampelography, DNA testing, etc) than any of us anticipated. The exam, evidenced by the looks of anguish, stress, fear, anger, exasperation, disappointment and helplessness of the candidates while writing and immediately afterwards, was difficult, and it should be difficult if it is to have significance and credibility. In the end, 26 of us (the other Canadians who passed including me were Michaela Morris and Richard Sagala) were certified as Italian Wine Ambassadors (no one achieved the higher certification level at this inaugural course). But the VIA certification is far from the culmination of our journey. The study of Italian wine is a lifelong journey and as Certified Italian Wine Ambassadors, we have a responsibility to not just continue our studies on Italian wine, but to ensure that we have a clear and in-depth knowledge and understanding of Italian food, culture and history as it is from these that Italian wine gets its context. And, while I have very basic Italian language skills, I have set a goal to become fluent within a year (how could I be comfortable as an Italian Wine Ambassador without being proficient in the language?). Also, I am sure that many (I plan to) will re-sit the exam in hopes to achieve the next level of certification (I also hope that the candidates who did not pass on the first attempt re-sit the exam). Ultimately, we have an excellent role model in Dr Ian d’Agata. I have always had great respect for his encyclopaedic knowledge and insight, but it is rare that an individual is both so unconditionally generous with sharing and adept at conveying his knowledge. There is no one better to lead VIA’s educational program as there is not a higher benchmark for us to strive. So what’s next? I look forward to working with my VIA colleagues to establish accessible, enjoyable and informative courses, tastings and events in Canada and beyond. The diversity of Italian wines may seem intimidating, but it is that diversity that makes them so fascinating. Italian wines are simply an extension of the country’s food, lifestyle and history. What better gateway to experience all that this culturally distinct and diverse country has to offer than through wine?